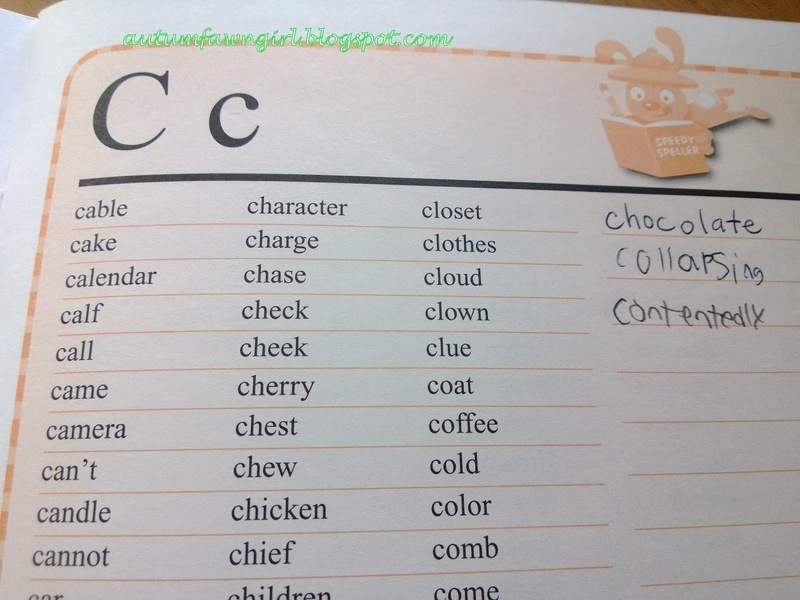 My 7-year-old daughter and I have been having so much fun reviewing READS Parent/Child Reading Comprehension System from EGM Educational Systems, LLC. 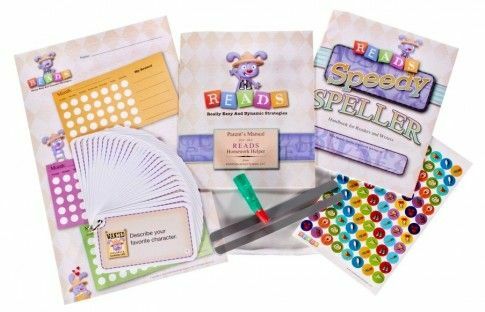 Developed by Elain Meyers, a teacher and reading specialist with over 25 years of experience, the READS (Really Easy and Dynamic Strategies) system is designed to help kids in grades 1-4 develop better comprehension and critical thinking skills. It also helps children improve their ability to express themselves verbally by encouraging communication between parents and children. Though the original intent was to help children with their reading homework, it works extremely well with homeschooling, especially the way I do literature with my own kids in their early elementary years which involves lots of reading and discussing. 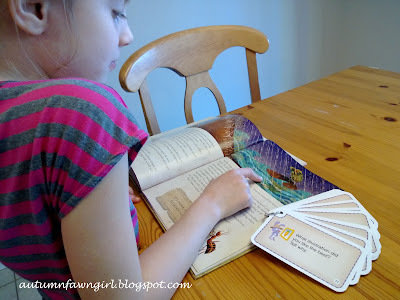 READS can be used with any reading material - fiction or non-fiction, and the Question Cards can be used even if your child doesn't finish a book in the allotted reading time. It really is a great tool for making sure your child has comprehended what she's read. My daughter read mostly picture books and a couple of novels appropriate for her grade level. The Parent's Manual explains each component of READS and how to use it with your child. It also contains all of the questions on the Question Cards with added descriptions and tips for using them with your child. These attractive, numbered, index-sized cards are conveniently stored on a ring. Makes them super easy to flip! Each card has one question and a visual Henry Hopper clue pertaining the the question. (Henry Hopper is the cute little bunny who serves as the READS mascot.) Most of the questions are pretty easy to understand, but there are 5 questions identified as Robust Questions that are a little more challenging. All 30 questions adhere to the Common Core Standards. These items help you track progress and helps your child strive to meet her goals. The colorful reward chart provides 105 spaces for stickers which is divided into 3 months' worth of being able to track reading comprehension. It is designed for your child to earn one sticker per day for an entire week (7 days) at which time a reward can be given. Lots of reward suggestions are provided in the Parent Manual. At the time I began writing this review, my daughter had already earned 3 rewards: 30 minutes of extra X-Box game time, a box of Nerds, and a no chore day. Now, she is striving toward a park day reward. 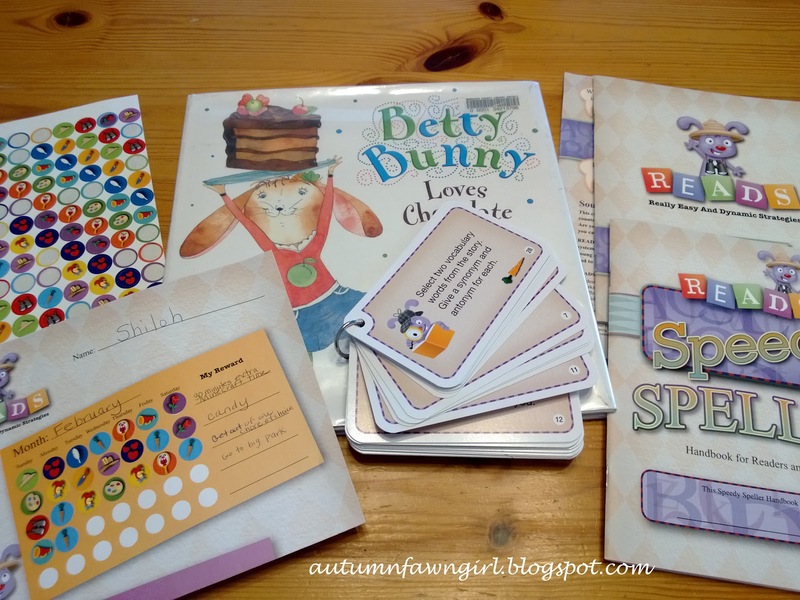 Stickers and rewards are always such great motivation tools for kids! Both tools will help your child focus while reading. 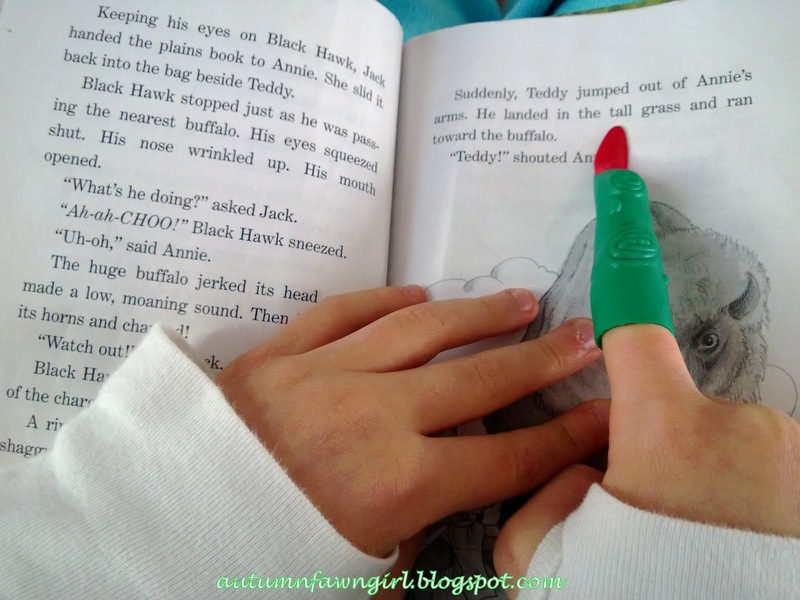 The Magic Finger helps your child not to lose her place, and the Reading Guide Strip keeps your child focused on one sentence at a time. My daughter didn't really need these tools, but she demonstrates how to use them in the following pictures. The Speedy Speller contains 1,400 common words and space for your child to write in her own words. 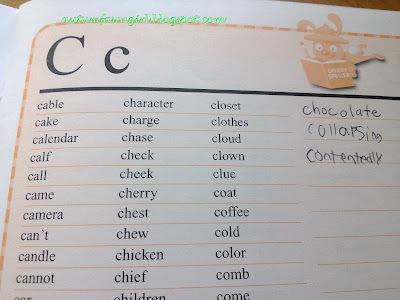 This tool is helpful if your child is writing something on her own and needs a quick spelling reference. It also provides punctuation and other symbols, capitalization rules, many types of abbreviations, and a note page. Sometimes I would have my daughter find interesting or difficult-to-spell words during her reading time to add the her Speedy Speller. **All of the items in the READS system can be kept in the provided, transparent storage pouch. The complete READS systems costs $19.95 plus shipping and handling. During the school week, my daughter would either read one picture book per day or spend several days reading an age-appropriate novel. She did not read any non-fiction books during this time. Each day we would choose a few of the questions and apply them to the picture book or chapters she read. At first, I chose the questions that I thought would be best for the particular book she was reading, but when she got pretty familiar with all of the questions and how things worked, she would tell me which questions she wanted me to ask her. :) I still choose at least one of the questions because there are some she'd probably never pick. Here she is showing me her favorite illustration in one of Aesop's fables. She also took a picture walk before she read Princess Pigtoria and the Pea by Pamela Duncan Edward and then found three interesting words and added them to her Speedy Speller. After reading the Magic Tree House book, Buffalo Before Breakfast by Mary Pope Osborne, she summarized the important events and described her favorite character. I asked her what she wondered about while reading Who Are You, Sue Snue? by Dr. Seuss and what surprised her when she read Good Enough to Eat by Brock Cole. Her big brother practically went through all of the questions with her after she read Don't Worry Douglass by David Melling. For The Three Bears by Paul Galdone she changed the ending. And these are just a few of the different types of questions your child will answer with READS. We covered almost all 30 during the review period. There are only a couple of the Robust Question cards that I am saving for later. After we would finish discussing what she'd read, she would place a sticker on the reward chart. Definitely her favorite part of the system! There's a place for a sticker for each day of the week, including Saturday and Sunday. 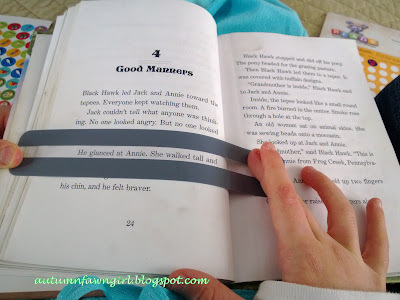 Now, when we first started using READS, my daughter was all gung ho and read books on the weekend. However, as time went by she didn't stick with weekend reading. So, we began ignoring the days of the week on the chart and just placed a new sticker on it every time she read a book. She still has to have 7 stickers to earn a reward, though. The READS Reading Comprehension System worked beautifully with our literature learning style for second grade. I liked the variety of the questions and that they made my daughter have to think about more than just what the story was about. It helped me not to get stuck in a rut of asking the same questions over and over again. I liked that my daughter looked forward to reading and answering most of the questions everyday. I think her least favorite question card was #20 - the one where it asked her to find interesting words and add them to her Speedy Speller. Typical kid, I guess. I thought READS was simple to use, fun to do, and nicely illustrated. I think it would be nice if more than one reward chart was included in the package, though. Overall, I think it's a great choice for helping your child with reading comprehension!